It's Free. It's Easy. Sign Up Today! 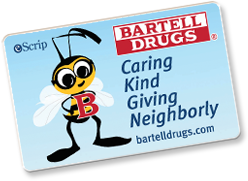 Pick up a 'B' Caring Card at any Bartell Drugs location. Present your card to the cashier at Bartell Drugs to earn for your school or nonprofit. of your purchase amount for your school or nonprofit every time you shop! © 2011 Electronic Scrip Incorporated. All rights reserved. Information on this website is confidential and cannot be used for any commercial purpose whatsoever.